Identification: This is a yellow to orange species with dusky patches on its notum. 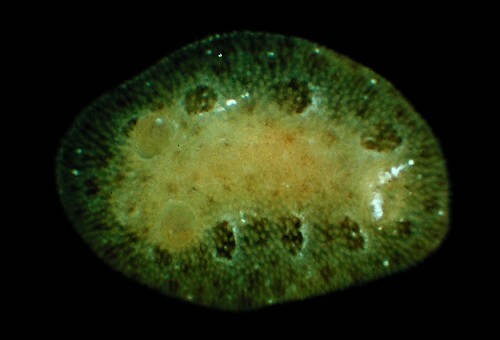 The lateral patches are larger and surrounded by light "halos." Natural history: Rostanga lutescens is known from only two very small animals found in moderately exposed rocky habitats at depths of < 9 m (< 30 ft). Distribution: Maui: widely distributed in the Indo-Pacific. Taxonomic notes: First recorded in Hawaii from Maliko Bay, Maui by CP on Aug. 23, 1996. There's some chance that these may prove different from the Indo-Pacific R. lutescens. Photo: PF: found by CP; Maliko Bay, Maui; Aug. 23, 1996.